The Graco FastAction Fold Jogger is actually the first jogger of its kind manufactured by Graco, and as many parents claim, this is the ultimate crossover stroller that is speedy, safe, comfortable and great to maneuver on all sorts of terrain. 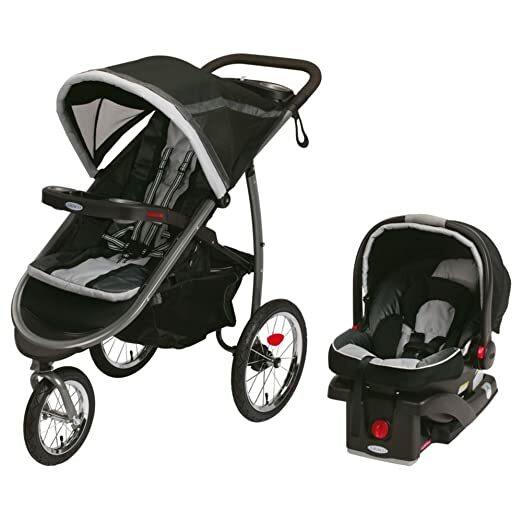 This jogger comes with rubber tires filled with air that ensure a smooth and hassle-free ride for the baby, along with a fully lockable front swivel wheel that offers them even more maneuverability over the jogger, along with extra stability. Besides this, another aspect that makes Graco FastAction Fold Jogger stand out from the rest is the fact that it comes with a one second Fast Action fold system, that makes this outstanding stroller very easy to store and transport. Overall, this is widely regarded as one of the safest, most secure and most affordable baby strollers on the market, and here you will find out more about its pros and its cons. Perhaps the most important and obvious advantage of the Graco FastAction Fold Jogger Click Connect Travel System/Click Connect 35 is the fact that it can help both you and your child stay fit, healthy and active in the long run. Moreover, the jogger also happens to be fully compatible with all the Graco Click Connect child car seats, and it has a secure one-step attachment that allows you to create your own and individual travel system, quickly and without the hassles. The seat is multi-reclining, it is extra padded and it is specifically designed to ensure the safety and the comfort of the baby when you are traveling – in addition to this, the stroller also comes with a deluxe tray for patients, that features a special smartphone cradle where you can safely and securely store your MP3 player. Last, but not least, many parents claim that it has an extra large storage basket which is great for storing all your essential (alongside your baby’s! ), and the stroller is to sturdy and well-constructed that it can hold up to 50 pounds at once. There seem to be some notable downsides to Graco FastAction Fold Jogger as well, downsides that every parent should consider before investing their money in this product. On the other hand, many have complained about the front wheel, saying that it keeps getting stuck and it does not allow them to turn the stroller regardless of how smooth the terrain actually is. Overall, the Graco FastAction Fold Jogger is certainly a good choice for children, one that will benefit them for more than just a few months. It features a lot of useful features that will undoubtedly come in handy, both for the child and for the parent! Baby Wrap Carrier &#8211; Which is The Best For You in 2017?